A successful vintage for the best producers in Montalcino, now fully mature, this will be great if partnered with a Bistecca Fiorentina. Tucked away off the Torronieri road the small Cerbaiona estate had been home to Diego & Nora Molinari since 1977, who produced their first vintage in 1980, all 70 bottles of it! 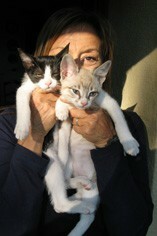 Due to advancing old age and ill health, Diego and Nora have reluctantly had to sell the estate recently. 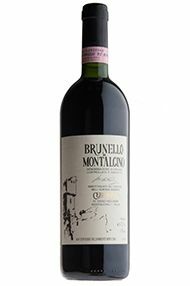 This led to an opportunity to purchase some of their back vintage holdings of their rare and highly sought-after Brunello di Montalcino, which we leapt at. The estate comprises 3 hectares of vines and 12 ha of wood and olive grove; half planted to Brunello, the rest to Sant'Antimo and IGT Toscana (using Cabernet Sauvignon, Malvasia Nera, Merlot & Syrah). Production is limited to 8,000 bottles. 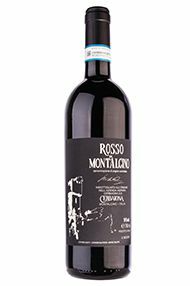 Lying on the north-eastern shoulder of the Montalcino commune the estate enjoys a fine eastern exposition at 390 metres elevation, with good aeration & galestro/alberese clay soils. This imbues the wines with a naturally good acidity. Diego did not use herbicides, pesticides or fungicides on his vines. This hands-off approach is reflected in their tiny winery, which is bolted onto the back of the 16th century property. A wooden press is preferred, followed by gentle vinification in cement & ageing in 20hl Slavonian botte. 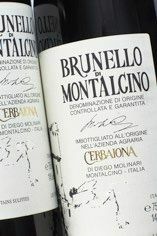 The Brunello spends 30 months in oak, followed by a year in bottle pre-release. Tucked away off the Torronieri road, the small Cerbaiona estate has been home to Diego and Nora Molinari since 1977, who produced their first vintage in 1980 (all 70 bottles of it). The estate comprises three hectares of vines and 12 hectares of woods and olive groves. Production is limited to 8,000 bottles. The ruby-coloured 2008 Cerbaiona Brunello is composed, with crunchy, cool, brambly black fruit, along with a hint of cloves. The whole shape of the wine is very impressive, displaying a Barolo-esque elegance and fabulous texture. The cool white tufo soils of this part of Montalcino lend a streak of minerality and poise. Beautifully judged, this is constant and sapid. Deep ruby with a narrow orange rim. Cool fruit and herbs on the nose. Remarkable sweet and ripe fruit on the attack with firm, bitter tannins. A successful balancing act, showing great concentration while keeping perfect focus and poise.